Papua New Guinea Prime Minister Peter O’Neill is confident in the strength of ExxonMobil’s commitment to the Papua New Guinea economy, saying there is scope for greater investment and job creation from one of its largest foreign investors. O’Neill made the comments after meeting ExxonMobil chairman and chief executive officer Darren Woods, and senior vice-president Jack Williams at the company’s headquarters in Dallas, Texas,. “The contribution that the PNG LNG project has made to our economy has been substantial and this will continue to grow,” O’Neill said. “ExxonMobil has demonstrated their continued commitment to PNG through the delivery and management of the PNG LNG project, together with ongoing exploration activities. ExxonMobil PNG Limited is the operator of the US$19 billion (K57 billion) PNG LNG project, the largest private sector investment in PNG so far. ExxonMobil is also working with partners to expand LNG processing at the PNG LNG plant site near Port Moresby. 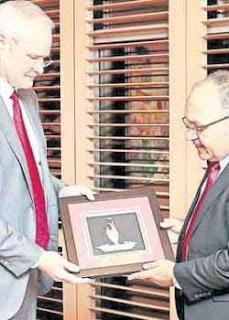 Woods said PNG was an important country in ExxonMobil’s global portfolio, “and we are committed to making our business successful for all parties”. He congratulated PNG for hosting Apec in 2018. “We are working closely with PNG’s Apec organisers to make the event a success for the country,” he said.